Iceland is an Island that is situated in the North Atlantic Ocean just outside the Arctic Circle and is considered a part of Europe. 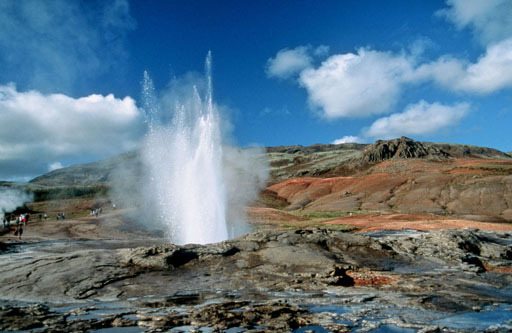 With a population of approximately 320,000 Iceland is also an area of volcanic activity. The country is relatively flat in its interior however there are also mountainous areas and glaciers that flow to the sea. 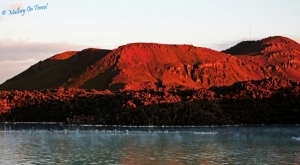 The capital and largest city is Reykjavik. Many travelers would not think to put Iceland on their agenda of places to visit however if you are an adventure seeker or looking to explore something different, there are spectacular sights to see and an amazing culture to discover. 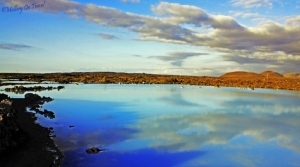 If you come from Mars or live under a rock you might not have heard of the Blue Lagoon in Iceland. A huge bathtub located about forty five minutes from Reykjavik; it is Iceland’s most popular attraction and is the most fun thing you can have swathed in silica slime. After spending a couple of hours at the National Museum of Iceland, even this culture vulture needed some relaxation so the Blue Lagoon it was. The museum is actually pretty cool; describing itself as “The Making of a Nation, Heritage and History in Iceland”. Entrance fee is fairly reasonable just 600ISK, which includes a guided tour. Choosing not to take the tour, basically because I could not be bothered to wait for it to begin I set off to enjoy the show. The exhibition is laid out in an interesting manner, with plenty of individual displays and artefacts. Exhibition halls are set-out in periods of history, with early history of the country on one level, including a ‘hands on’ exhibit where you can feel the weight of a chain mail vest and take photographs in traditional Viking costumes. The displays on the other floors take visitors through later periods of Icelandic history, finally arriving completely up to date with artefacts from the modern era. There is also a contemporary photographic gallery, some of which were interesting but it was a pretty eclectic display, with some very random pieces, but that is the nature and beauty of art! A visit to this museum is thoroughly recommended; it is a worthwhile way to spend an hour or two when there is some time to kill. 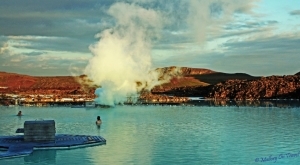 Soon however I was boarding a bus for the highlight of the day The Blue Lagoon. There were only a handful of people on the bus and on arrival the driver pointedly made it clear that the bus would leave exactly on time. Therefore it is not a good idea to be late as that’s a long walk back to Reykjavik. There is a pool outside the entrance which looks positively blue, in fact, it appears a bluer than the lagoon itself which seems a little milky to me, though the official description is frosty blue. The entrance fee is included in the bus fare, so it is just a case of handing in an exemption ticket, which is exchanged for a high-tech bracelet which allows you access and operates the locking system for the personal lockers, all very clever and cool. A shower is compulsory and then you step out into the lagoon itself. It is one large pool really, but appears natural as the perimeter is lava rather than a swimming pool wall. The water as I have already mentioned appears a milky blue colour, obviously it is very warm, but the temperature varies throughout the lagoon, some places much warmer than others. It is divided by a series of bridges which give the impression of smaller individual pools. There is also a steam room and a small waterfall feature that is absolutely great, standing underneath it whilst it literally pummels the shoulders, or whatever is directly under its flow. I would suggest however that your shoulders are less likely to result in the need to be rushed to the nearest Accident and Emergency Unit! The tension seems to ebb away however, a very stimulating and ultimately relaxing experience. There are also a couple of large vats of a kind of white silica slurry sited around the lagoon. This is smeared all over yourself or a very close friend and is supposedly beneficial for the skin. A combination of the slurry and the lagoon visitors apparently emerge looking years younger, My age was actually queried when I asked for a glass of wine in the restaurant later …………. honest! 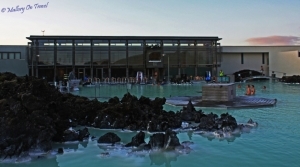 The warm water is a result of the geothermal heating under the earth, but the lagoon is actually artificial. The water is pumped up by the nearby Svartsengi power plant from which it is a run-off. There is a spill over point into the lagoon, and the water around this is the hottest area of the lagoon. It is kind of fun playing a game of ‘chicken’ attempting to get as close to the spill over as possible. I managed to get within about five feet, but the silver amulet worn around my neck, kept getting very hot, the burning sensation preventing me getting closer, maybe I am more of a wimp than was thought. After awhile the skin begins to wrinkle, to avoid resembling a large pale prune, make a sharp exit before too long. There is a restaurant and it is worth having a meal there. Ordering the arctic char and a glass of red wine, it was just as well I had brought my passport as proof of my age after that dip in the pool of eternal youth. I then headed out to take some photographs of the lagoon. I was asked to take a picture of a girl and her friends, no problem. She then seemed to ask everybody with a camera if they would to do the same, she had more pictures taken in ten minutes than Kate Moss probably gets in six months! After getting my model to ‘really work it’ it was time to retire to the restaurant and enjoy that char, I had been looking forward to trying it since arriving on the island and it was worth the wait. The dessert menu was tempting too, but having a cast-iron willpower, I resisted the urge. Besides didn’t want to be late for that bus, which incidentally left ten minutes late, so much for leaving us behind to walk, guess his bark was thankfully worse than his bite. If you enjoyed Iain's story head to his website for more of his adventures.